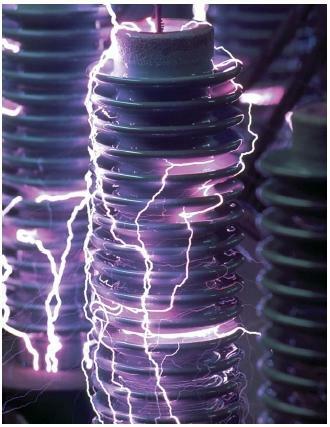 Electricity is a form of energy caused by the presence of electrical charges in matter. All matter consists of atoms, and atoms themselves contain charged particles. Each proton in an atomic nucleus carries one unit of positive electric charge, and each electron circling a nucleus carries one unit of negative electric charge. Electrical phenomena occur when electrons escape from atoms. The loss of one or more electrons (negative charges) from an atom leaves behind a positively charged fragment known as a positive ion. An electric current is produced when a mass of electrons released from atoms begins to flow. Electrical phenomena can be classified in one of two general categories: static electricity or current electricity. 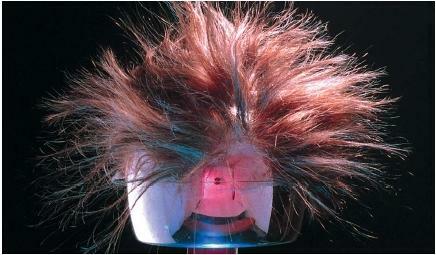 The term static electricity refers to the behavior of electrical charges at rest. Suppose you hang two ping-pong balls from silk threads so that they are about 2 inches (5 centimeters) apart. Then imagine that each ball is rubbed with a piece of wool. The two balls become electrically charged with the same sign. Because like charges repel each other, the two balls will swing away from each other because of the static charge on each one. for them. That pathway is called an electric circuit. An electric circuit typically consists of a source of electricity, such as a battery; an appliance that operates on electric energy, such as a toaster; a meter that measures the flow of electrons, such as a galvanometer; and metal wires connecting those parts of the circuit. The two kinds of electric charges—positive and negative—have the same magnitude (size, force, or intensity) but opposite effects. The magnitude of an electric charge has been measured very accurately and been found to be 1.602189 × 10 −19 coulomb. The unit used in measuring electric charge (coulomb; C) was named after French physicist Charles Augustin de Coulomb (1736–1806), an early authority on electrical theory. The coulomb is a fundamental property of matter, like the mass of an electron, the gravitational constant, and the speed of light. Since a single positive charge and a single negative charge have the same magnitude, their combination produces a net charge of zero. That is, +1.602189 × 10 −19 C + −1.602189 × 10 −19 C = 0. All atoms normally have equal numbers of protons and electrons and are, therefore, electrically neutral. This fact explains the absence of electrical phenomena in everyday life. A person walking across ordinary grass normally does not get a shock because grass, dirt, and air are all made of electrically neutral atoms. Only when electrons or protons begin to accumulate do electrical events occur. One such effect can be observed when a person shuffles across a carpet. Friction transfers charges between shoe soles and carpet, resulting in the familiar electrical shock when the excess charge sparks to a nearby person. Lightning is another phenomenon caused by the accumulation of electric charges. At some point, those charges become so large that they jump from one cloud to another cloud—or between ground and cloud—producing a lightning bolt. Any charged particle alters the space around it. For comparison, think of any object in space, such as a planet. The region around that object (in this case, the space around the planet) is affected by the object's (the planet's) presence. We call that effect gravity. A second object placed in the gravitational field of the first object is attracted to the first object. A space probe sent in the direction of another planet, for example, is pulled toward that planet's surface by gravitational attraction. Electric charges have similar effects. Imagine a ping-pong ball carrying a negative charge is suspended in the air by means of a silk thread. Then, a second ping-pong ball is placed in the vicinity of (or near to) the first ball. The second ping-pong ball will be attracted to or repelled by the first ping-pong ball. The second ball experiences a force of attraction or repulsion caused by the nature of the electric charge on the first ball. The region in space over which that force exists is called an electric field. The law describing the force between charged particles was discovered by Coulomb in 1777. Electrical force, Coulomb found, depends on two factors: the electric charge on any two objects and the distance between them. That force can be expressed as an inverse square law. That is, the force between two charged particles decreases as the distance between them increases. When the distance is doubled (increased by 2), the force is reduced by one-fourth (½ 2 ). When the distance is tripled, the force is reduced by one-ninth (⅓ 3 ). And when the distance is made ten times as great, the forced is reduced by . Potential difference. Any collection of electric charges (such as a large mass of electrons) has certain characteristic properties, including potential difference and current flow. Potential difference, also called voltage, is the amount of electric energy stored in a mass of electric charges compared to the energy stored in some other mass of charges. Imagine a small box into which electrons can be pumped. Pushing the first few electrons into the box is not difficult. But the more electrons in the box, the more difficult it is to add additional electrons. Electrons are all negatively charged, so they repel each other. Adding electron number 1,001 to the box, for example, is difficult because it must overcome the repulsion of 1,000 electrons already in the box. Adding electron number 10,001 is even more difficult. The more electrons that have been accumulated, therefore, the greater their pressure to escape. The giant spark machines that are sometimes displayed at science fairs illustrate this point. Electrons are added to one of two large metal balls that make up the machine. Normally the air between the two balls is a nonconductor of electricity: it does not permit the flow of electrons from one ball to the other. At some point, however, the number of electrons on the first ball becomes too large to maintain this nonconductive state—the potential difference between it and the second ball is just too great. Many electrons jump all at once from the first ball to the second ball, producing a giant electric spark. rush out of the power plant, through transmission wires, and into the consumer's home. There they flow through and turn on a microwave, a CD player, a television set, a VCR, or some other electric device. Electric current. The rate at which electric charges flow through a circuit is called current. The formal definition of current (designated by the symbol i) is the number of electric charges (C) that pass a given point in a circuit (a path of current that includes a power source) per second (t). Mathematically, i = C/t. The unit of current flow is the ampere (amp, or A), named for French physicist André Marie Ampère (1775–1836). One ampere is defined as the flow of one coulomb (a measurement of electrical charge) of electrons per second. Electrical resistance. The flow of electrons in a circuit depends on two factors. One factor is the potential difference or voltage in the circuit. The other factor is resistance, a force similar to mechanical friction that reduces the flow of electrons through a material. Nearly all materials have at least some resistance to the flow of electric current. Those with a smaller resistance are said to be conductors of electricity. Those with a greater resistance are called nonconductors, or insulators. The unit of electrical resistance is the ohm (Ω), named for German physicist Georg Simon Ohm (1789–1854). The amount of current that flows through an electric circuit can be expressed mathematically by a law discovered by Ohm in 1827. Ohm's law says that the amount of current in a circuit is equal to the potential difference in the circuit divided by the electrical resistance, or i = V/r. The most useful way of expressing the amount of work available from an electric current is electric power. Electric power is defined as the product of the voltage and current in a circuit, or: P = V · i. Thus, a circuit with a high potential difference (voltage) and a large current is a source of a large electric power. Most people are familiar with the unit for electric power, the watt (W). The watt was named for English inventor James Watt (1736–1819). One watt is defined as the product of one volt times one ampere, or 1 W = 1 V × 1 A. Most electric appliances are rated according to the electric power needed to operate them. Ordinary lightbulbs, for example, are likely to be 25 W, 60 W, or 100 W bulbs. At the end of each month, local electric companies send consumers a bill for the amount of electric power used during that time. The bill is based on the number of kilowatts (thousands of watts) and the price per kilowatt in the consumers' area. Nicely done, quite an amazing and concise page to gather. That was excellent and concise. Even if you had very little knowledge about electricity, you would grasp the gist of it at once when you read this. First-class! Thank you to whomever wrote this. This is one of the best intros to electricity I've ever read. i know electic materials ? and insulator materials are manufacturig sites. whats the name for the electrical unit based on the number of electrons? and how mant electrons does it represent??? does it make a difference to the output voltage if two or more electrostatically charged spheres are discharge in series or parallel? Which comes first - electrical arcing or ionized air. Do you have to have ionized air to have electrical arcing?